This Shining Profusion Diwali Hamper suits perfectly as the mark of your Diwali-exclusive greetings for your valued ones and enables you to secure a certain place in their cores. 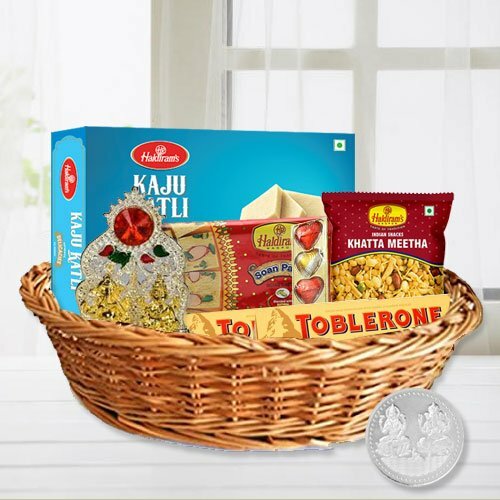 This soul-gladdening Pack displays a crowded Basket of 250 gm (Gross Weight) Haldirams Soan Papdi, 250 gm (Gross Weight) Haldirams Kaju Katli, 250 gm (Gross Weight) Haldirams Khatta Meetha Mixture, 2 Pcs Toblerone Chocolates, 5 Pcs Homemade Chocolates, a Laxmi Ganesh Mandap 1 Free Laxmi Ganesh Silver Plated Coin and 5 Dairy Milk Chocolate Bars. Note: Basket design may vary with respect to stock. Flowers Delivery Udumelpet, Send sweets Raichur, Wedding Cake Varanasi, Diwali Mithai Agartala, Send Flowers and Gifts to Renigunta, Online Shop Kakinada, Flower to Nawashahar, New Year Flowers Ongole , Fresh Fruits Silvassa, Send Gift Dholpur, Dry Fruits to Kanpur, Birthday Delivery Sirsi, Sending to Hissar, Flower shop Coimbatore, Vishakhapatnam Online Cake Delivery.